We thought for sure Maui would be the first island we would visit twice, in memory of our honeymoon, but we both fell hard for Kauai. The landscape is like nothing I’ve ever seen before. Lush, mountainous, tropical, rugged, and simply put: jaw-dropping beautiful. It feels less populated and more protected than Maui, giving it a peaceful serenity that instantly washes over you. 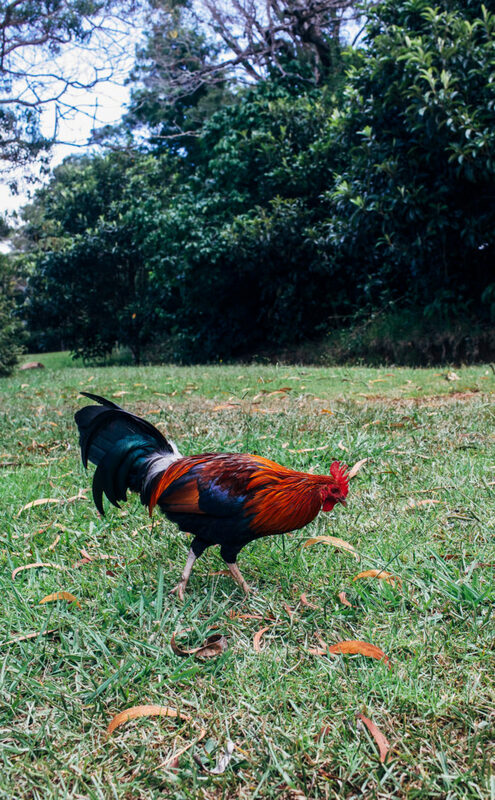 Outside of the insanely gorgeous scenery, our favorite feature had to be the wild chickens. Back in 1992 Hurricane ‘Iniki freed many of them from local farms and they now roam the island. They manage to pop up all over the place, searching for scraps of food and crowing at random times throughout the day. It was especially charming to watch the baby chicks follow their moms around. 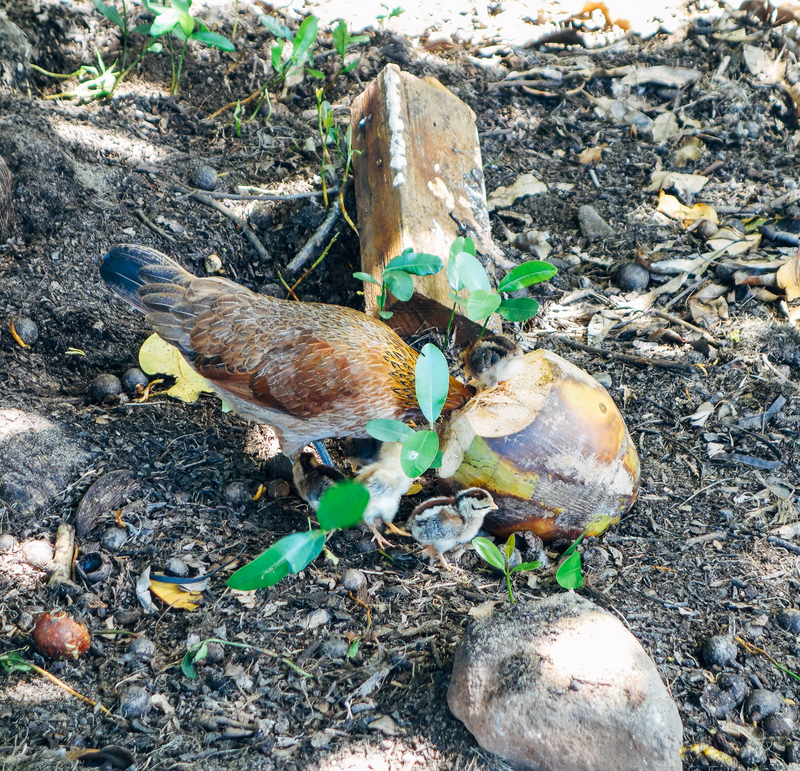 We even spotted this little family drinking from a coconut! I didn’t get too close in fear of disturbing them, but if you look closely you can see the mama has her head inside of it. 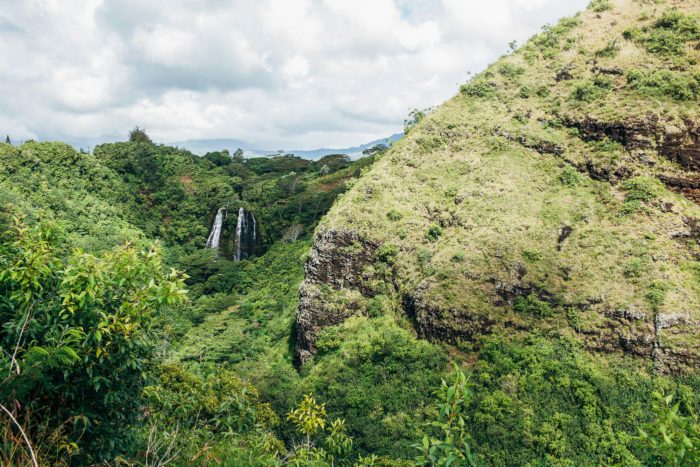 To be honest, I almost didn’t want to write this post because a small part of me wishes I could keep Kauai all to myself, but it’s too magical of a place not to share. If you’re looking for a special spot to vacation, I highly recommend visiting here at least once in your lifetime. Although I have a feeling once you do you’ll end up like me and want to go back as soon as possible! Choosing which side of the island to stay on can be quite challenging but we ultimately decided on the south due to it’s it’s reliably sunny weather, beautiful beaches and central location between popular activities in the west and the north. 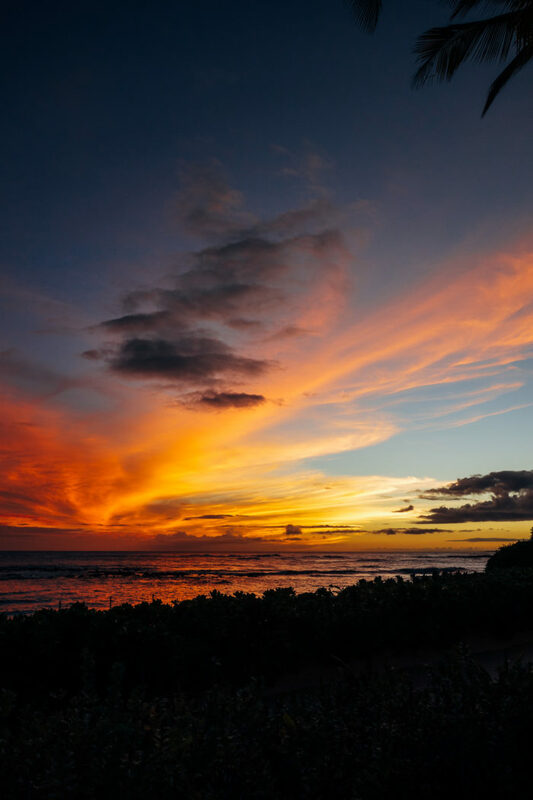 Koa Kea Hotel & Resort is a boutique 121-room oceanfront property that was ranked #1 in all of Kauai by Travel & Leisure and it’s not hard to see why. 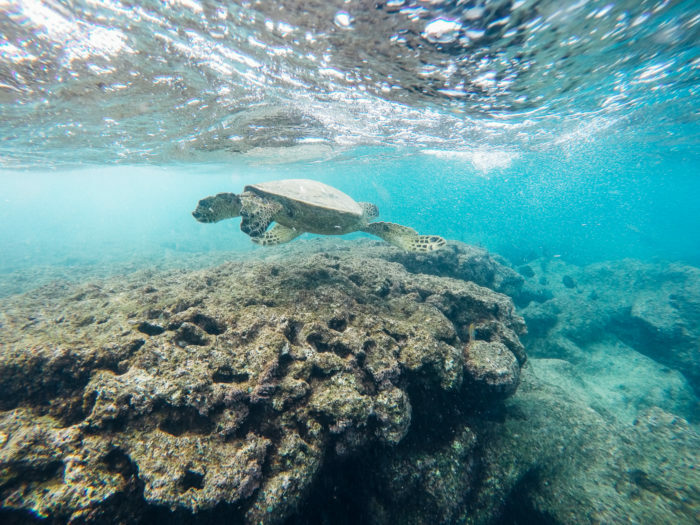 It’s nestled directly on the tranquil sands of Poipu beach offering a safe place to swim, snorkel, and kayak. 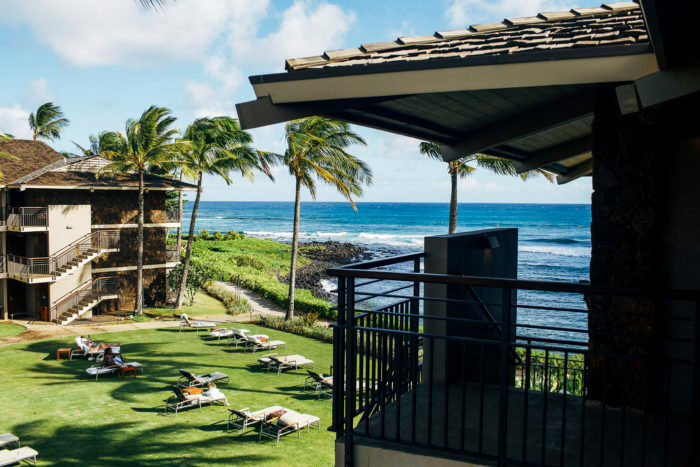 With luxurious amenities like a serene saltwater pool, an oceanfront spa, and the renowned onsite restaurant Red Salt, it’s the perfect spot to relax and enjoy the beauty of Kauai. 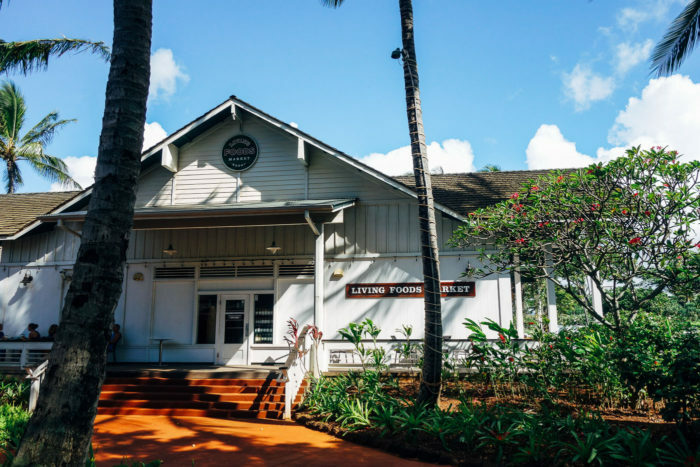 From the moment we arrived, we knew we were going to love our stay at the Koa Kea. 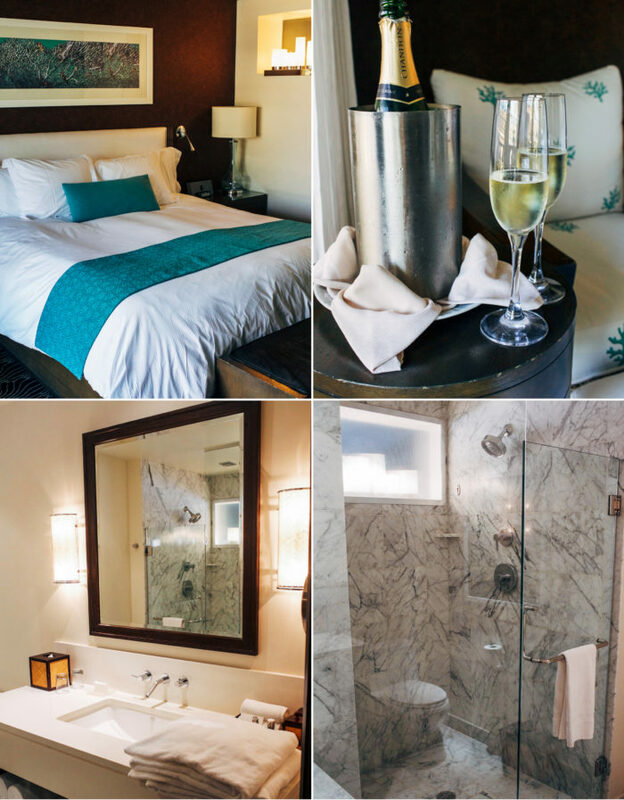 Tasteful beach-themed decor, gorgeous marble bathrooms, and a cold bottle of champagne? Consider me at home. One of the first things we did (after finishing our champagne, of course) was head down to the pool for a dip and then to the beach to take in the first of many colorful sunsets. 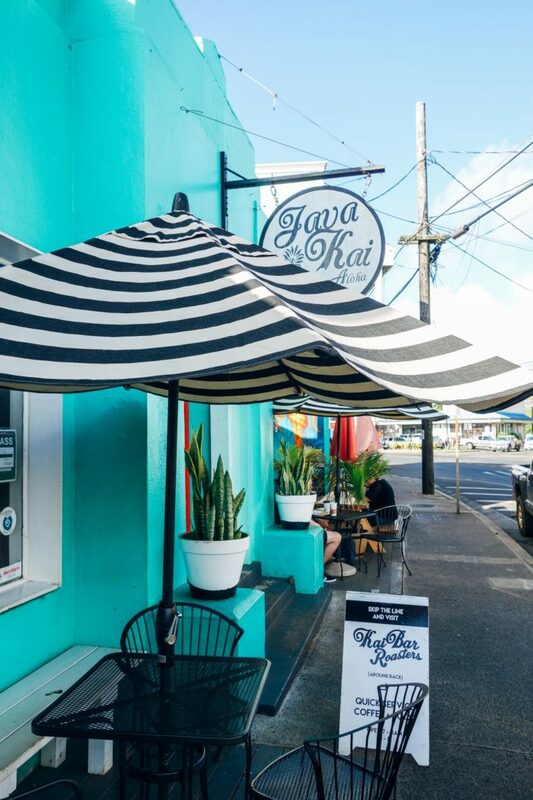 Our first meal on the island was lunch at Java Kai in Old Kapaa Town. I’d first heard about the Aloha Bars from Traci and since then made it a personal mission to try one during the trip. Because I may be a little obsessed with the chocolate, macadamia, coconut combo. Besides drool-worthy pastries (with vegan and GF options!) 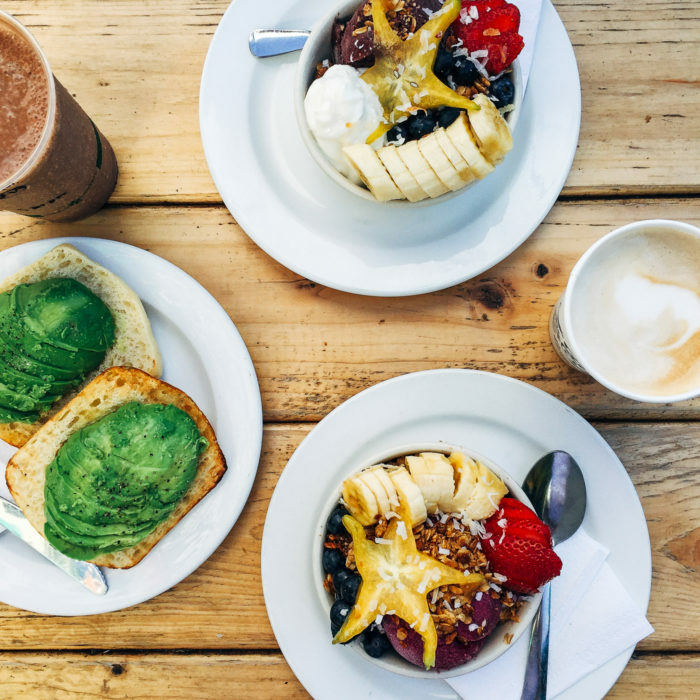 they also offer organic coffee and smoothies along with a good selection of healthy lunch and breakfast options made with locally grown ingredients. We liked it so much that we went back the next morning. I highly recommend this place! 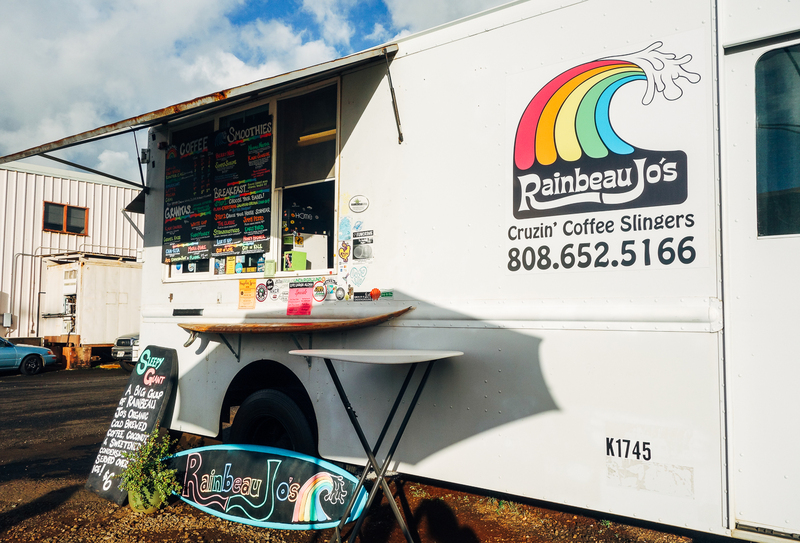 Whether you have an early flight or are just passing through Lihue, you absolutely have to stop at Rainbeau Jo’s. 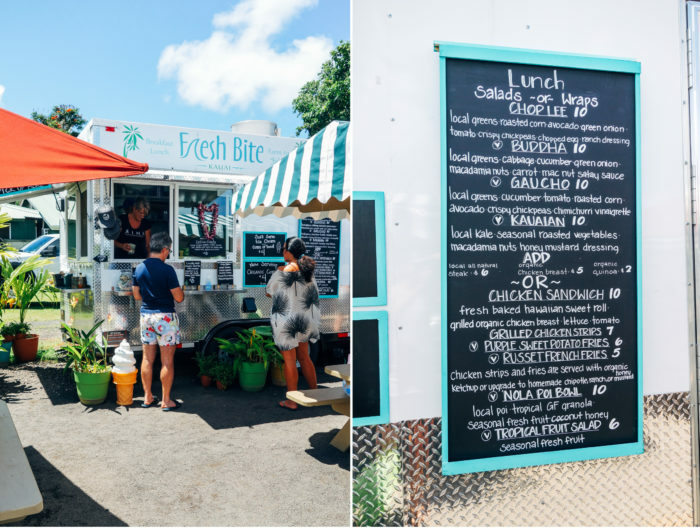 This adorable food truck is run by a local couple (Beau and Jo…so cute, right?!) that will instantly make you feel like they’re your old-time friends. 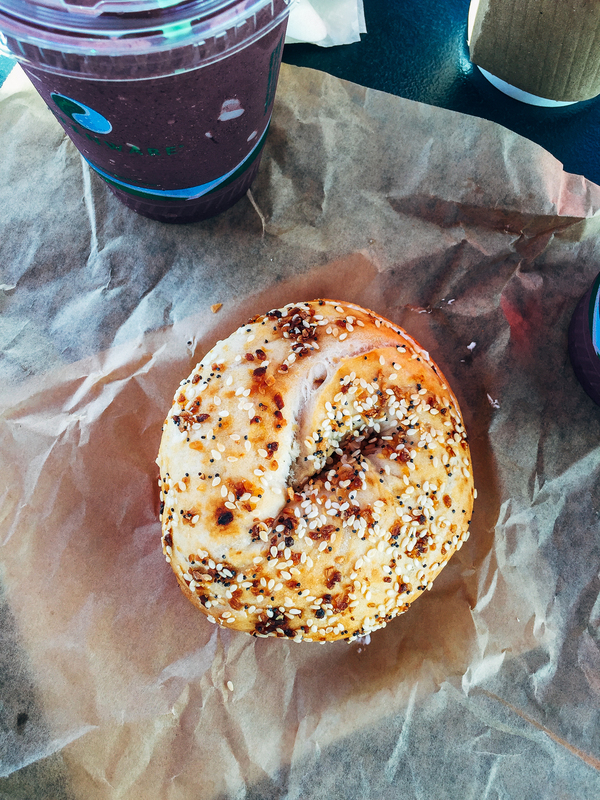 It’s located less than 5 minutes from the airport so we grabbed a couple of bagels and smoothies to fill us up before our flight left on the last morning. Everything was awesome and Brandon said their organic coffee was some of the best he’s ever had. That’s quite the statement because he’s had a LOT of coffee. Added bonus: they give you a punch card for free goods for when you come back one day. Because they know you’ll be back! Another great recommendation from my dear friend, Traci. 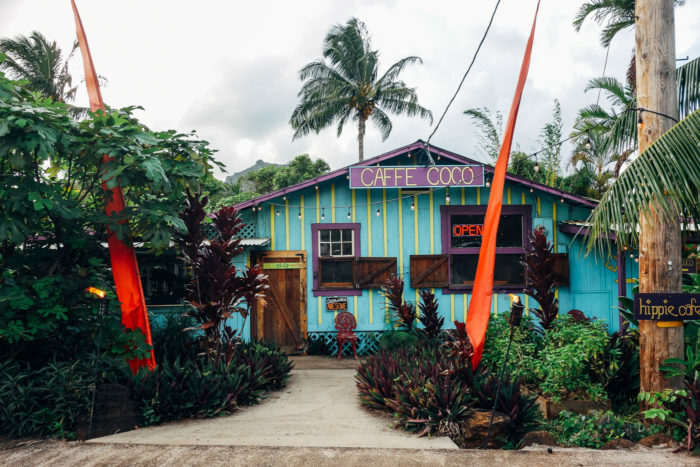 The Coconut Cup is a quaint cafe located on the east side in Kapaa. Their breakfast burritos and organic fruit smoothies are delish but it was the Lava Acai Bowl that really blew me away. We ate here on our way to hike in the north and it kept us full for most of the day. 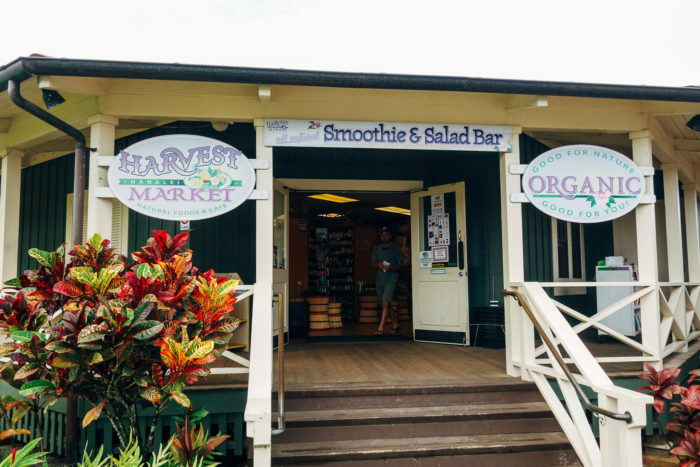 Located on the south side, less than 5 minutes from Poipu Beach, Living Foods Market is a great place to stop for a hearty breakfast and healthy snacks before heading out the Waimea Canyon area. The herbed crispy potatoes with sweet onion are to-die-for! 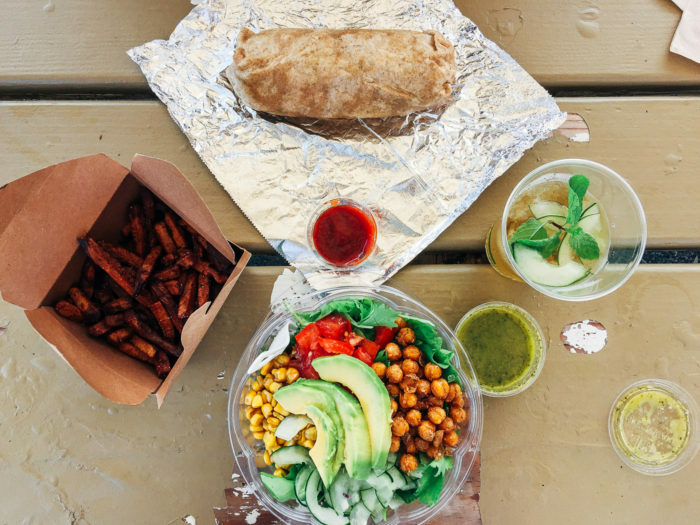 I had read lots of great reviews about this food truck and it definitely lived up to the hype! Fresh Bite Kauai is located in Hanalei (the north side) and offers healthy fare sourced from local and organic farms. 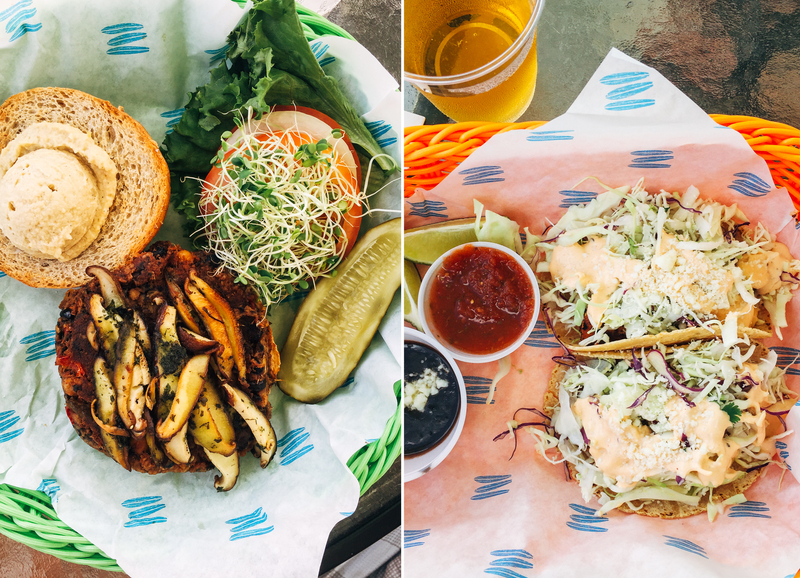 We stopped in for lunch in between snorkeling at the nearby beaches and it was the perfect casual spot to enjoy a nice meal. 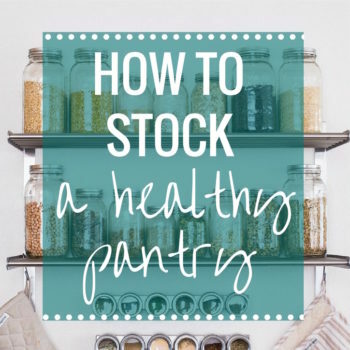 With ingredients that fresh and flavorful, you can’t go wrong. This isn’t a place I would typically eat at but it’s unique to Kauai so I figured, why not give it a try? 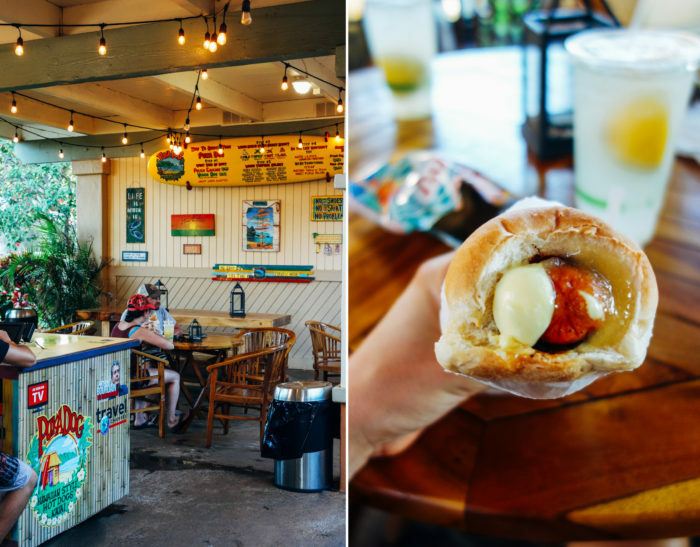 Puka Dog is known for serving up Hawaiian-style hot dogs (and veggie dogs!) 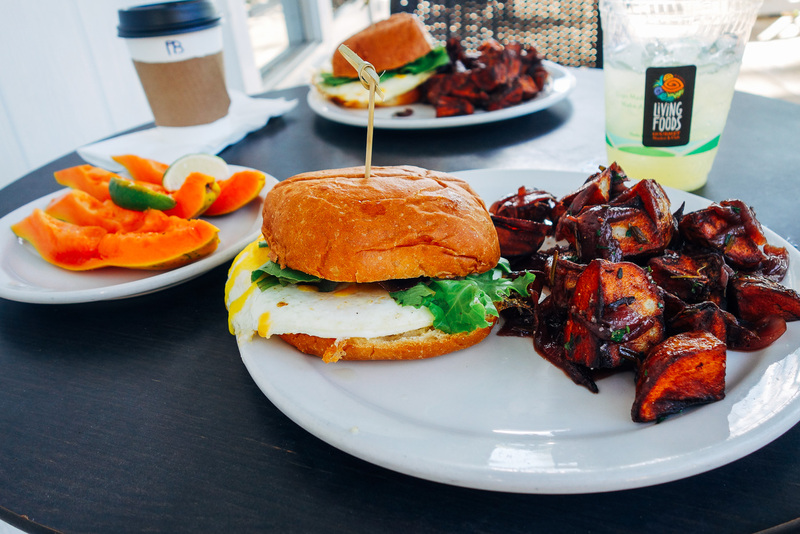 topped with a secret garlic lemon sauce and Hawaiian fruit relish in a sweet bread bun. It was good but I wasn’t blown away by mine, mostly because I’m a dill relish and ketchup kind-of-girl. Brandon, however, loved his. He ordered it with their special Hawaiian-style mustard (he hates ketchup) which I think made a big difference. 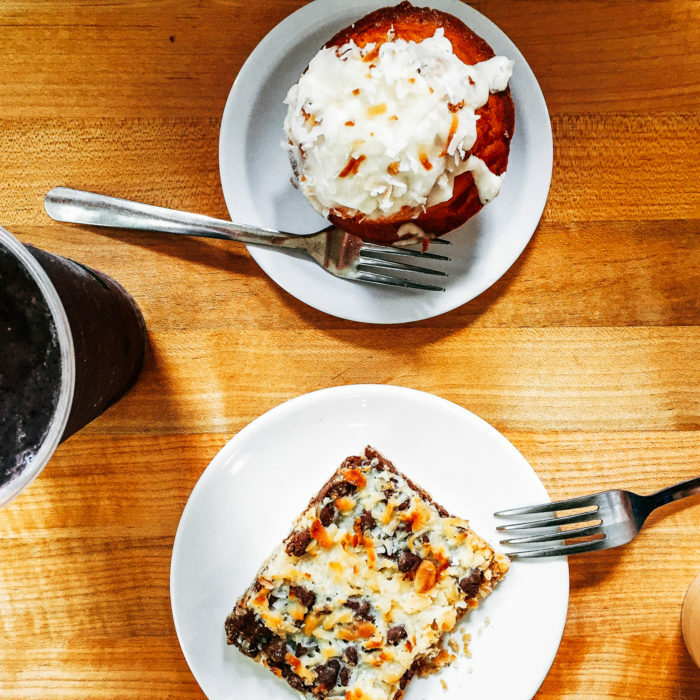 Either way, it’s a good spot to indulge for a casual lunch or dinner. Another good spot to visit in your bathing suit. We decided to walk to the Hyatt pool bar from Poipu beach for lunch one day and it’s definitely worth the extra steps. The view of the Hyatt’s massive pools is impressive as is the homemade veggie burger. If you’re planning on a long hike in the north, this is the perfect place to pick up a few sandwiches and snacks to take with you. The tempeh sandwiches are tasty and hold up surprisingly well when smashed into a backpack. The west side of the island is pretty barren so we were thankful to find this little gem at the Waimea Canyon Lookout. 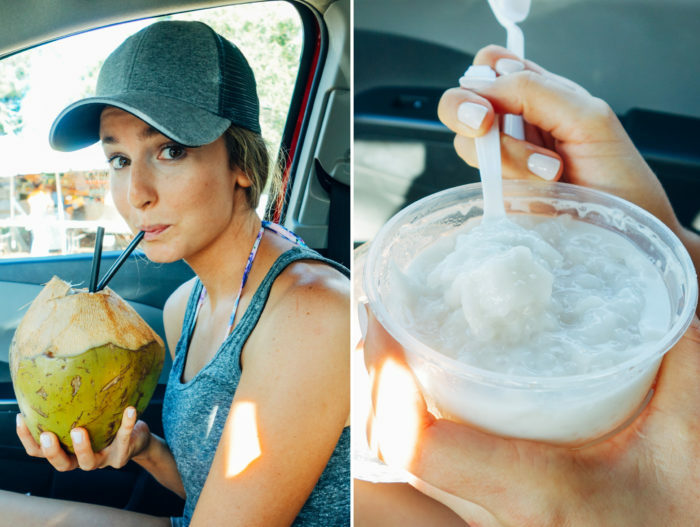 The woman who runs the stand offers a variety of homemade Hawaiian treats including coconut tapioca pudding. It’s the perfect refreshment after a long hike! Want to enjoy dinner and the sunset on the beach without getting out of your swimsuit? I feel ya. The good news is that Brick Oven Pizza delivers to pretty much anywhere on the island. And they also offer huge salads and an option for whole grain crust. That way you can balance out all of the tropical drinks. 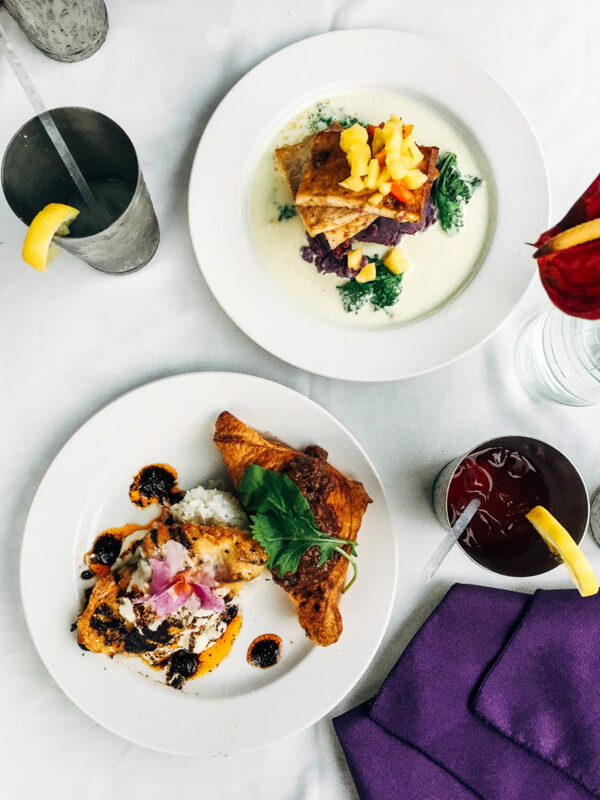 This fabulous restaurant is located in Poipu Beach at the Koa Kea Hotel & Resort. 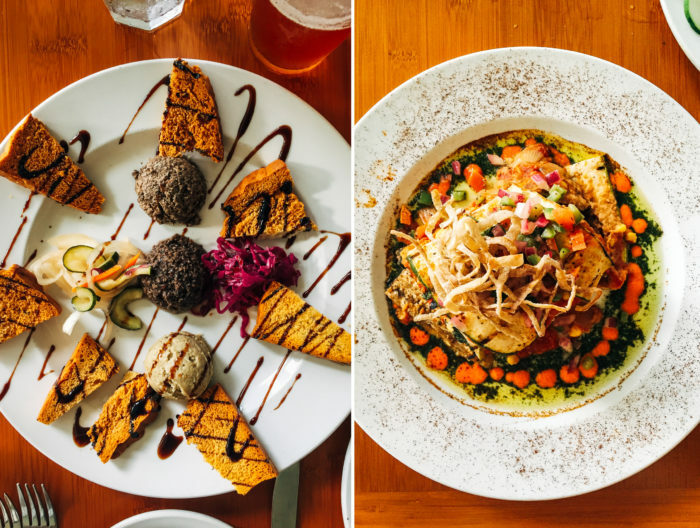 We were blown away by their vegan option for dinner (a pickled tofu dish that was too dark to photograph) but they’re especially known for their seafood dishes. 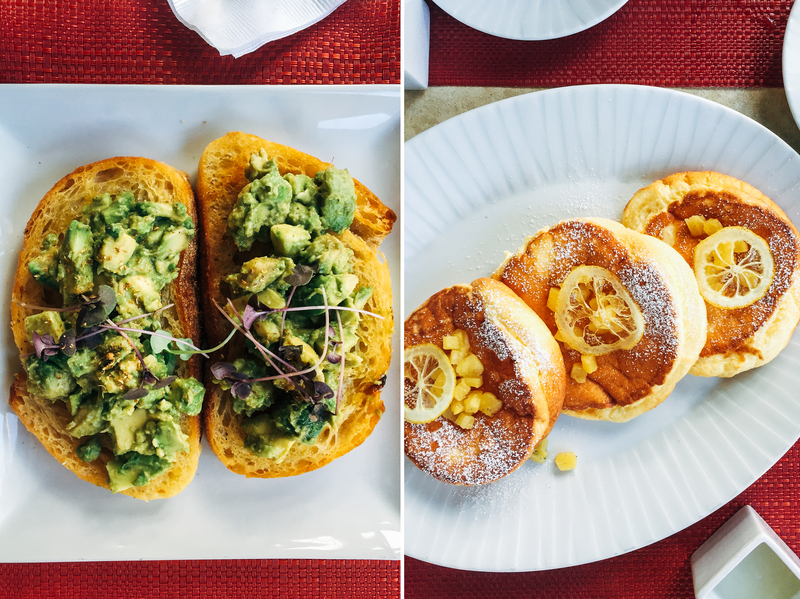 For breakfast they offer things like avocado sourdough toast and lemon pineapple souffle pancakes. My personal favorite is the mini banana muffins that they deliver when you first sit down. My kinda place. 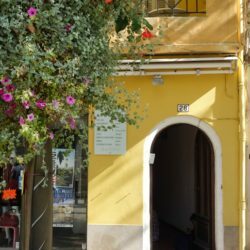 This was our favorite dinner restaurant on the island. 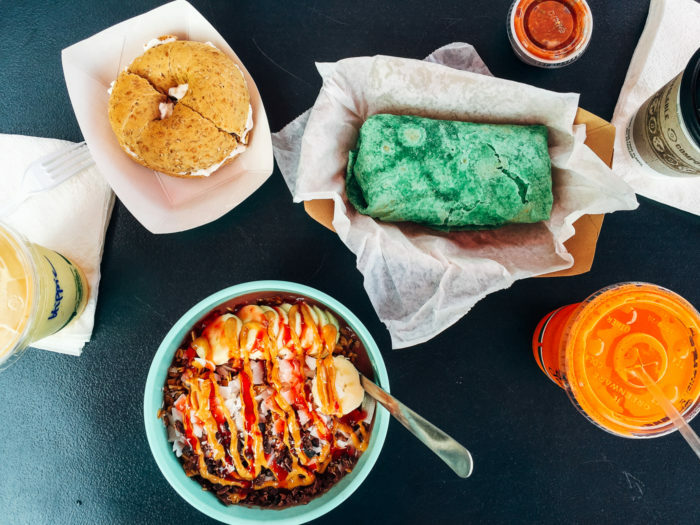 Cafe Coco is located on the east side and specializes in healthy organic cuisine with vegan and GF options for every dish on the menu. 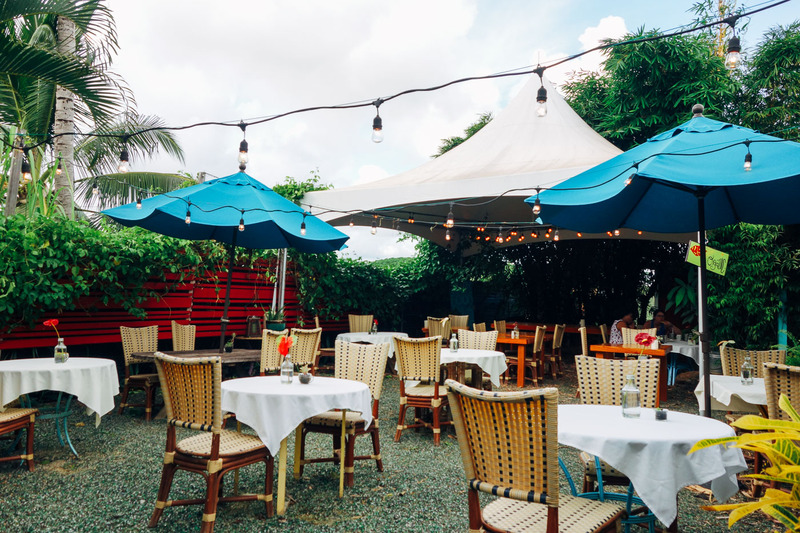 The outdoor patio is a unique romantic setting to enjoy the fresh air and gentle Hawaiian breeze. 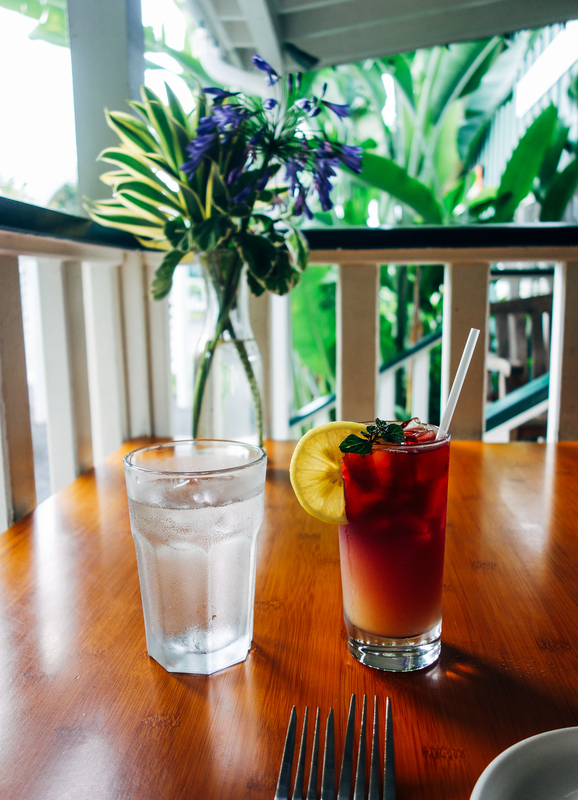 If you want alcohol you’ll have to bring your own otherwise they offer delicious drinks like Hibiscus Tea and Tahitian Lemonade. For food, you can’t go wrong but the purple potato samosas with banana chutney are pretty amazing. 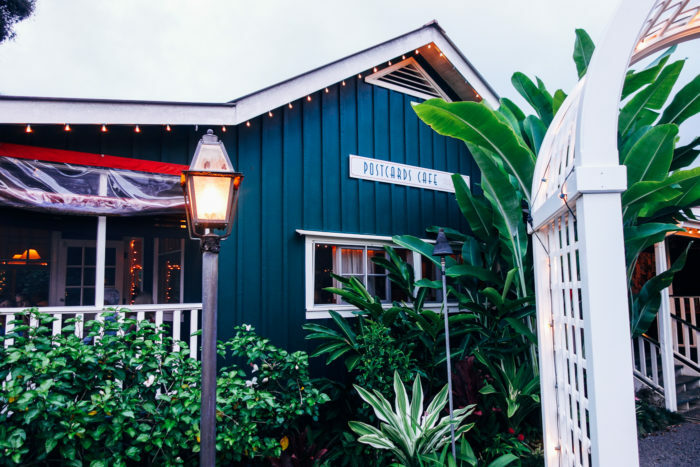 This is another place with great ambiance that’s located in Hanalei on the north side. 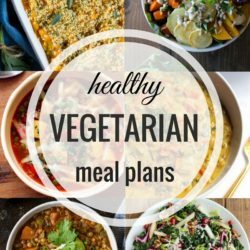 They specialize in vegetarian and seafood cuisine made with organic and locally grown produce. Be sure to request a table on the patio to enjoy the garden setting! Okay, so I know Jojo’s gets all the attention but Loco Coco is new and town and I think it’s only a matter of time until he outshines his competition. You can tell he’s using real fruit because it tastes super fresh and flavorful. It’s also just a short drive from Poipu Beach so it makes the perfect afternoon snack after a long day snorkeling at the beach. 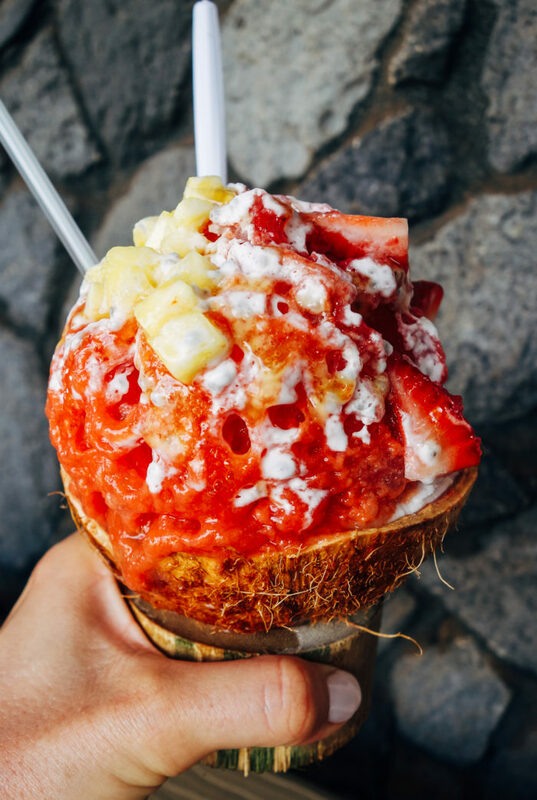 I never would have found Tropical Dreams had I not done my research ahead of time because it’s tucked away in a small shopping plaza in Kapaa. 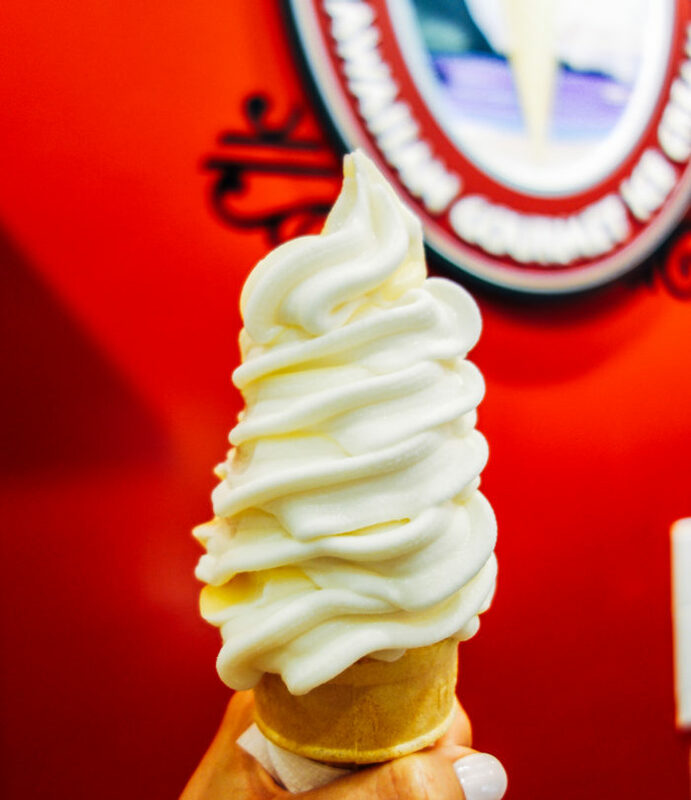 It’s rated the best ice cream on the island and they have vegan soft serve which makes it an automatic win in my book. 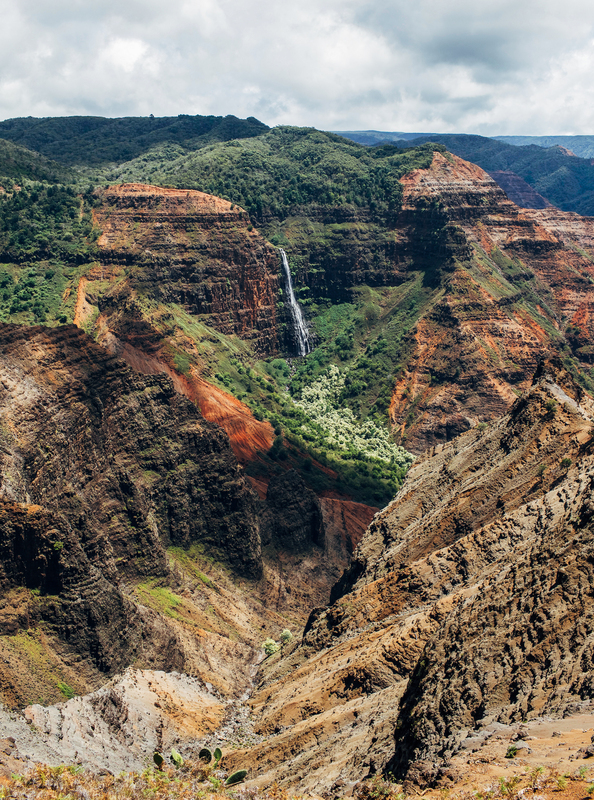 Said to be the Grand Canyon of the Pacific, Waimea Canyon is a must-see when visiting Kauai. Spanning 10-miles long, 1-mile wide and more than 3,500-feet deep, this massive canyon is a sight to behold. 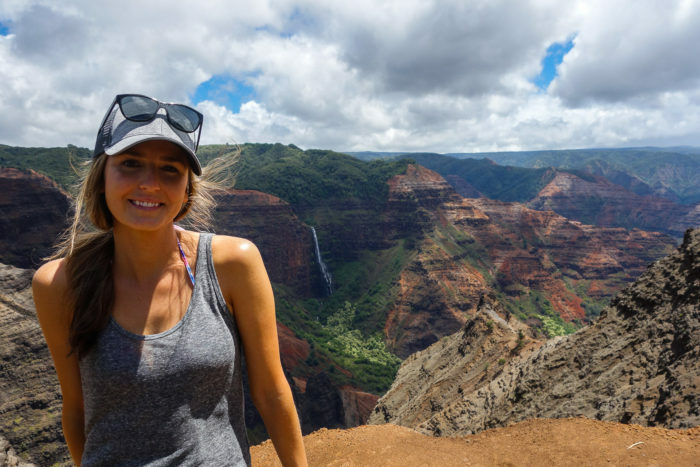 As you drive north from Waimea Canyon, you have the option to stop off at several different lookouts. 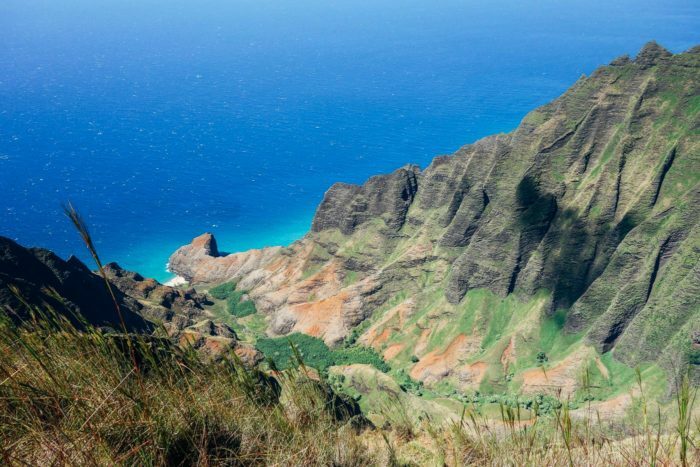 Make sure you go all the way to end, past mile marker 18 to the Pu’u o Kila Lookout to be treated to the best view of the stunning Kalalau Valley, which is the largest on the Na Pali coast. 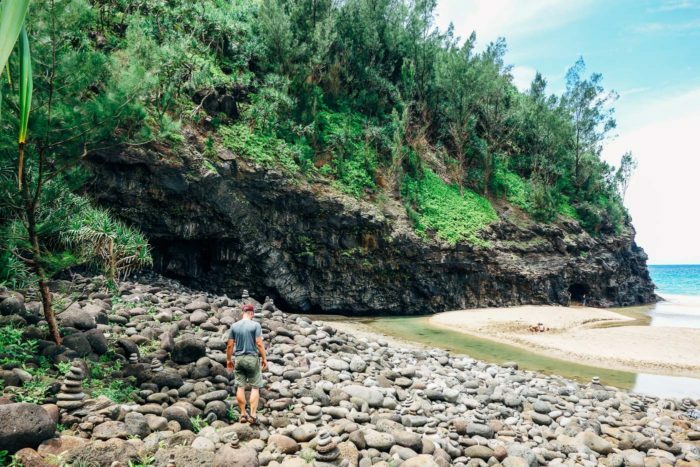 If you’re up for some hiking, the west side offers some of the best on the island. We opted for the less traveled hike to Honopu Ridge which is 4.1 miles out-and-back on an unmaintained trail. I feel the need to warn you that this is a brutal hike with many opportunities to injure yourself. I had to wear long pants and a rain jacket to keep from getting scratched to death by overgrown ferns. It’s also easy to get lost and the 1400-feet elevation gain on the way back can be exhausting. 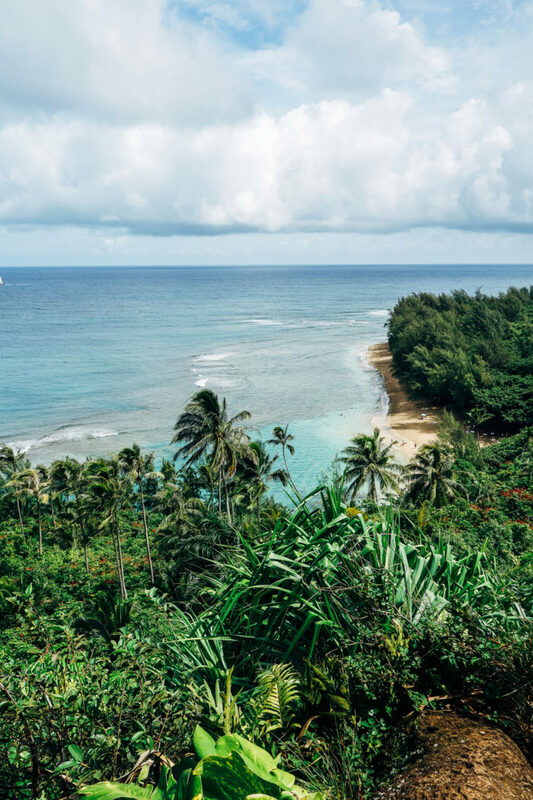 However, if you’re willing to tough it out, you are rewarded to a spectacular view of Honopu Valley that you’re likely to have all to yourself. This is also the only spot you can see Honopu Beach (which can only be accessed by swimming) from land. We sat here for about 30 minutes before hiking back and in that time we saw at least four helicopters flying in the 3,000-foot deep valley. They looked like tiny specs of lint floating in the air. 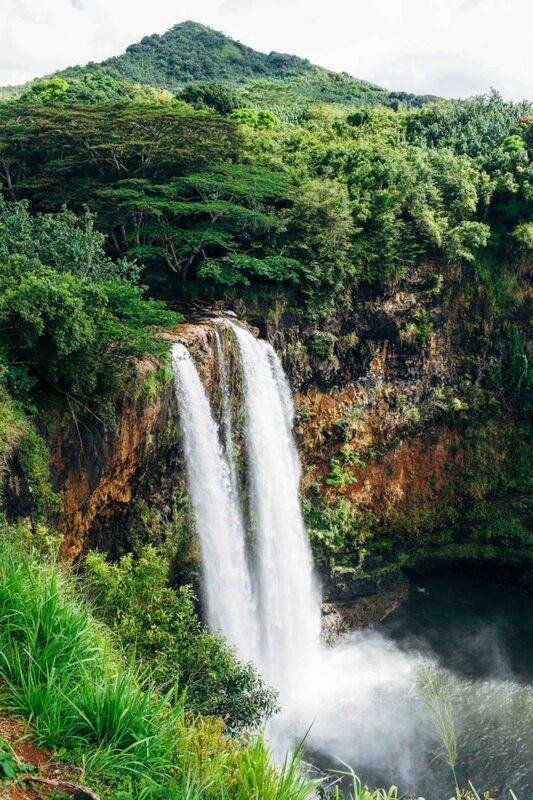 Wailua Falls is probably one of the most beautiful and easiest waterfalls to see on the island. All you have to do is drive up and park. When you’re done at Wailua Fllas, you can make the 20-minute drive to see the lacy 151-foot ‘Opaeka’a Falls. 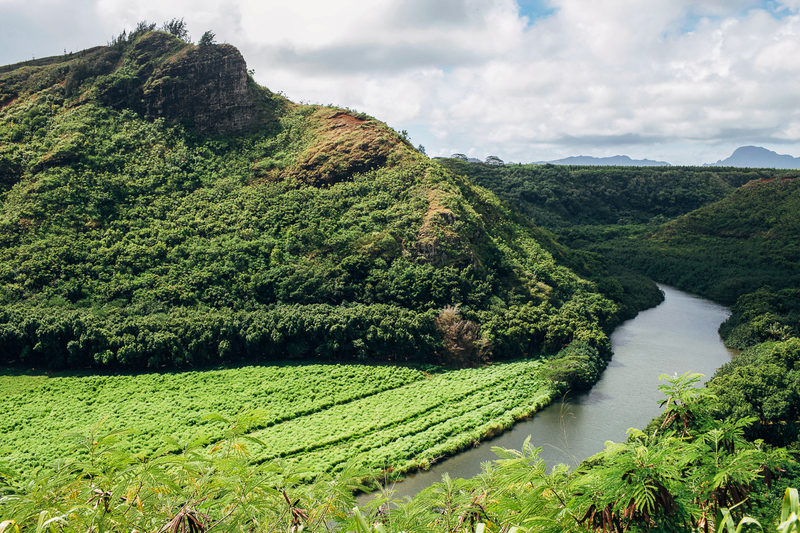 Don’t forget to check out the awesome view of the Wailua River across the street when you’re done! This hike is not for sissies but it sure is worth it. Getting to Hanakapi’ai Beach without slipping on the steep muddy terrain is a feat in itself. Many people decide to stop at that point and for good reason. The 2-mile trail to the falls feels like it takes a lifetime and there are some moments where you question why you are putting yourself through it. Then you get to Hanakapi’ai falls, take a swim in the refreshing pool and it comes back to you. This is what Hawaii is all about. Side note: you’ll want to wear waterproof hiking shoes for this hike. I was very thankful for my KEEN’s that day. 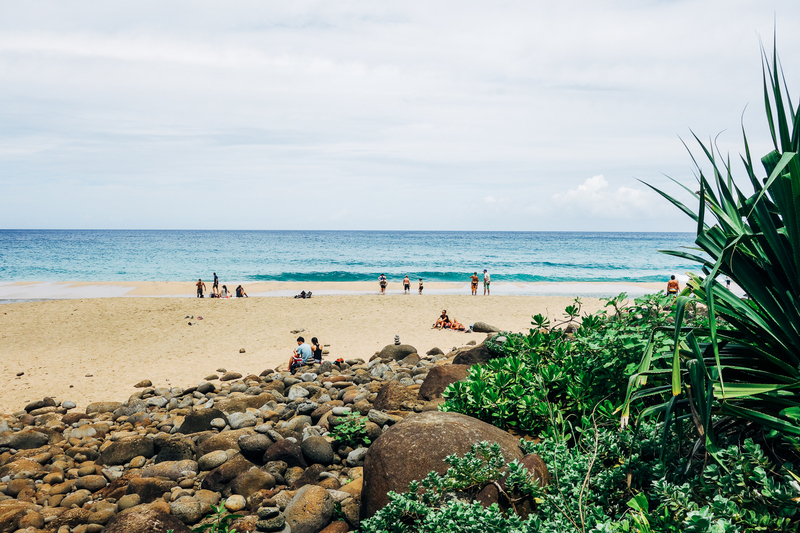 Ke’e Beach is where the Kalalau Trail begins and it makes a fabulous spot to rinse off and snorkel after a long hike. 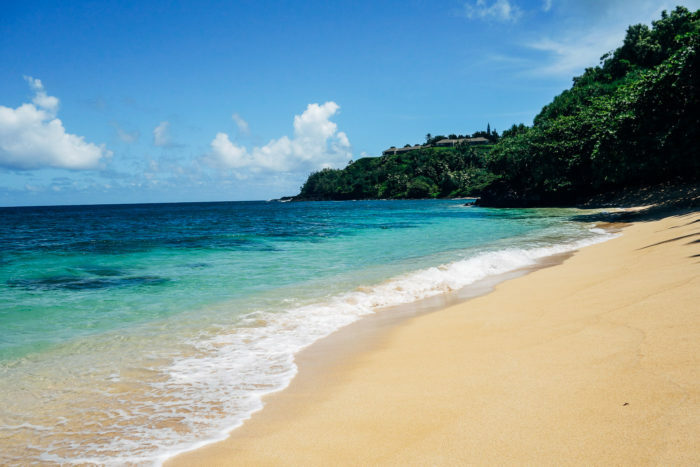 This beach is just a few minutes from Ke’e and also offers some great snorkeling. We saw our first sea turtle of the trip here! 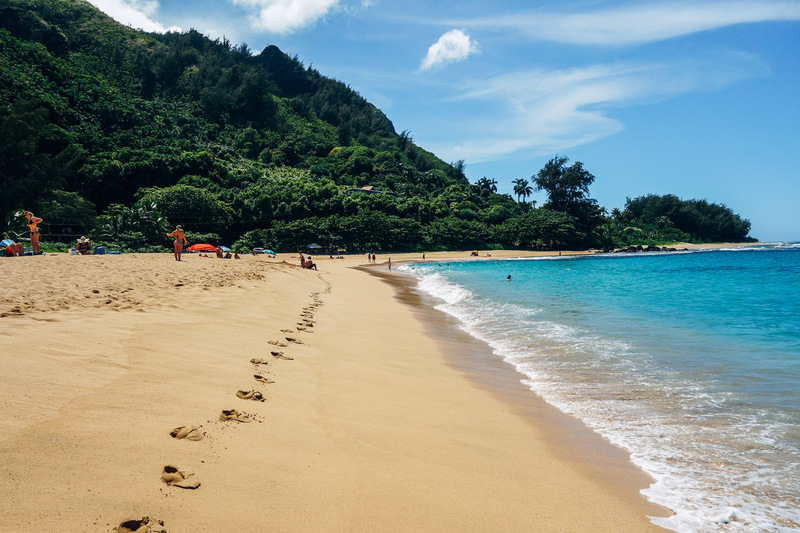 This beach is located right next to the St. Regis and requires a 10-minute, mildly strenuous hike to access. Parking is very limited (which means there’s usually not a lot of people at the beach) but you can park at the St. Regis as long as you tip the valet. If you choose the latter, be sure to take a stroll inside and marvel of the view from the hotel. You won’t believe your eyes! 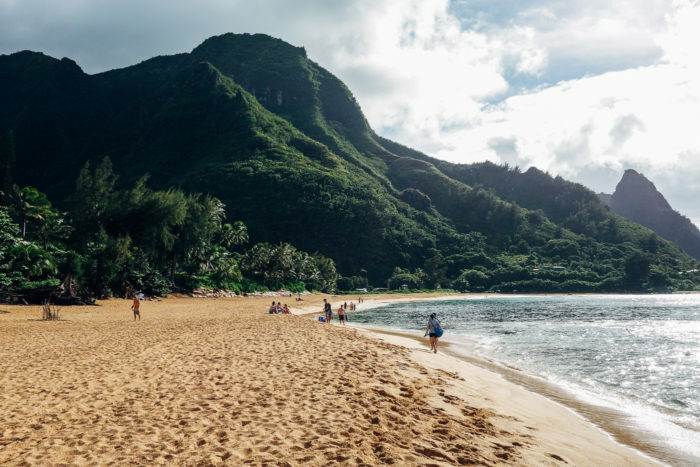 The lush mountainous backdrop and enormous reef with excellent snorkeling make this my favorite beach in all of Kauai. Pictures don’t do it justice. The pull off (past mile marker 8) is easy to miss and parking is limited so you either have to come early or luck out and get there when someone is leaving. Don’t be tempted to park on the street because they will give you a ticket. We saw a police officer writing one as we left. Not as great for swimming but it’s good for a relaxing stroll to take in the awe-inspiring view. Every Sunday from 4-8pm is the Hanalei Night Market at the Princeville Shopping Center. 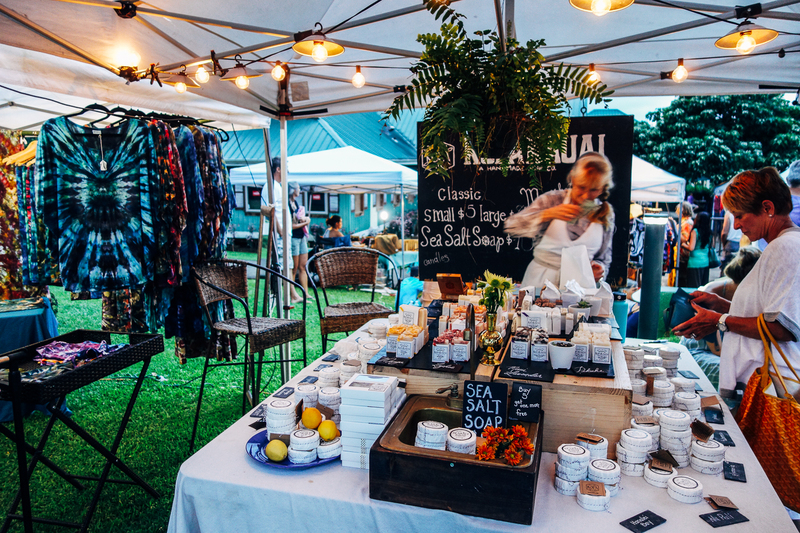 With live music and over 40 local artisans, it makes for a nice spot to do a little shopping. The sea salt soaps are divine! We randomly discovered this pasture while driving from the north to the south one evening and seeing a couple of cars pulled off to the side. 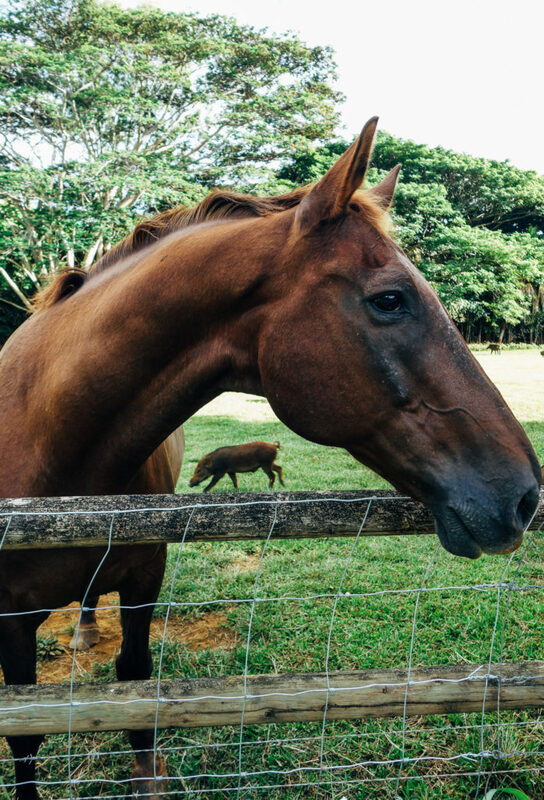 Apparently locals (and tourists) like to bring their kids to feed the horses and the feral pigs that occupy the pasture which is owned by a couple that runs a wildlife sanctuary. After reading this article I’m not sure how much longer the pigs will be there but I have to admit, they are pretty entertaining to watch. If you decide to stop, be sure to do so carefully and look out for oncoming traffic. 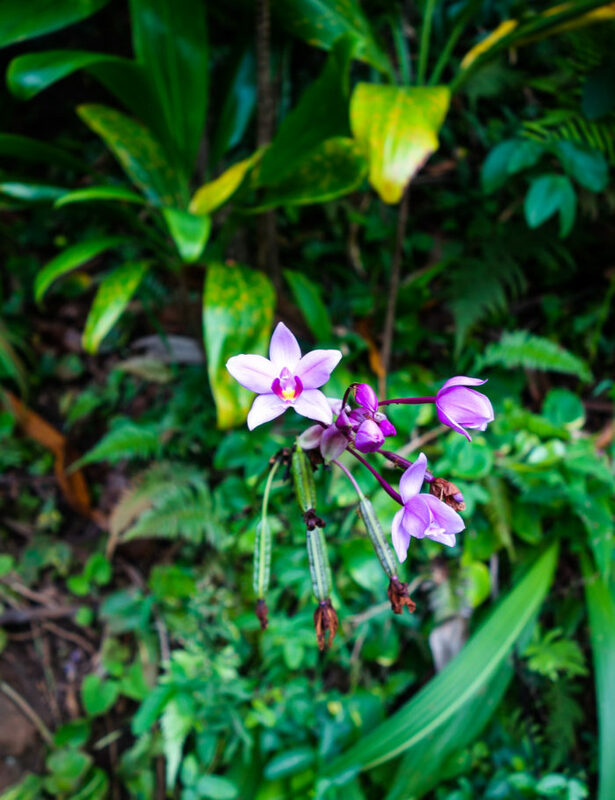 What are your Kauai favorites? Please share in the comments below! I swear, everywhere you go is on my bucketlist and I always use your reviews as a reference! 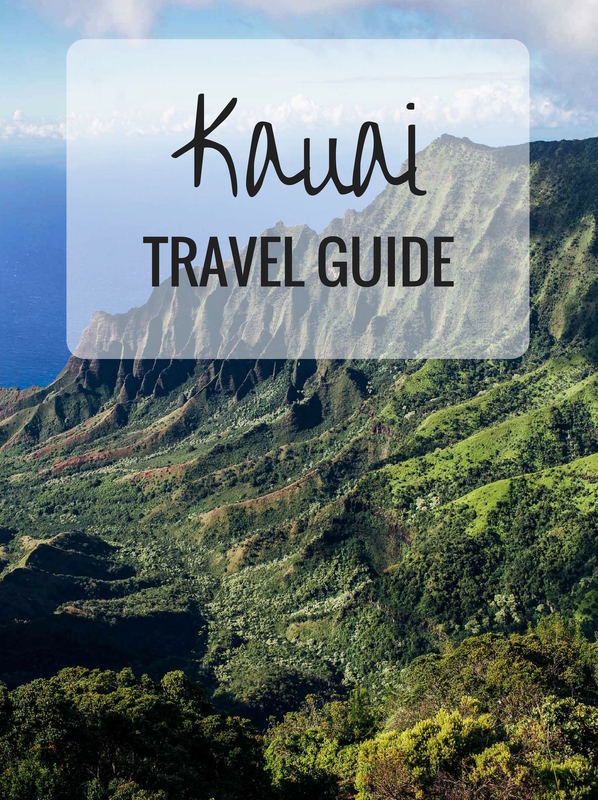 We are going to Maui and Kauai in March and I cannot wait!!! Ahh! I just got back but I’m still so jealous of you, lol! 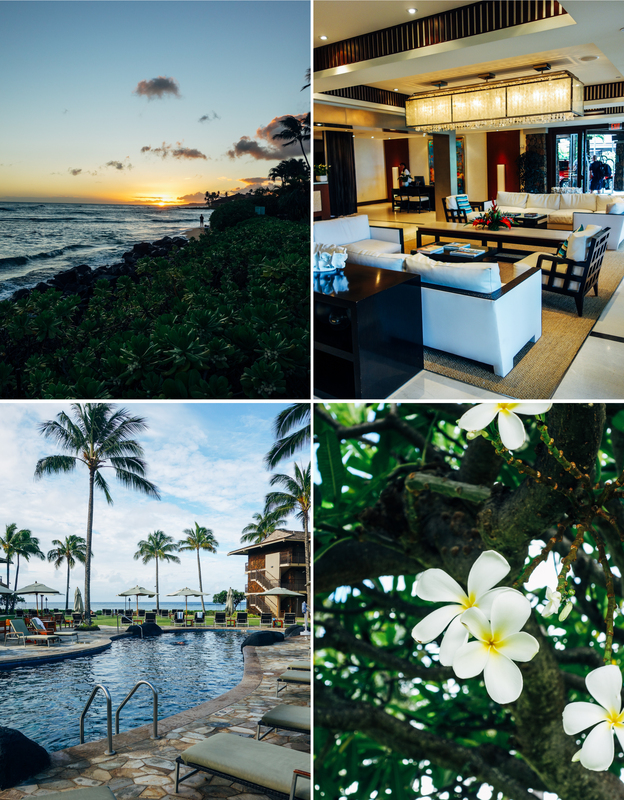 Maui and Kauai…man, it doesn’t get much better than that! 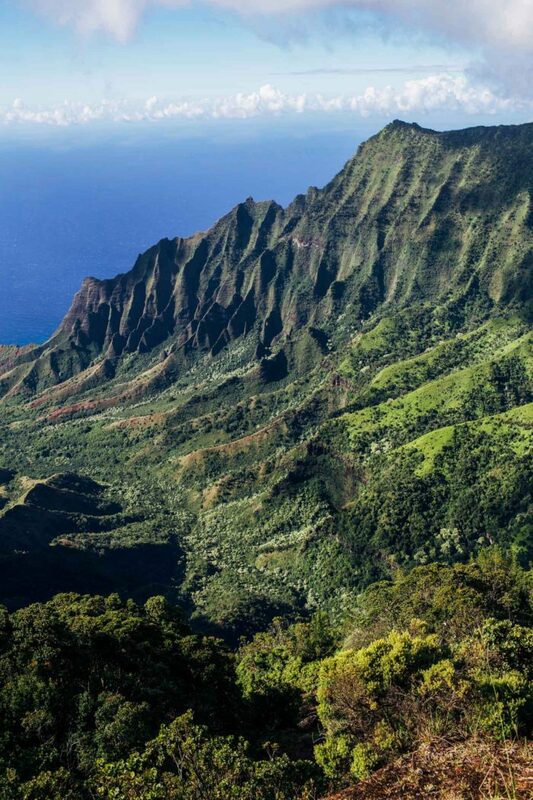 Hawaii is definitely on my list and it looks so amazing! Love the videos too. Ahhh, I want to go on vacation now! Hawaii is so awesome! I hope you get to go one day soon! Your travel posts always make me want to travel! 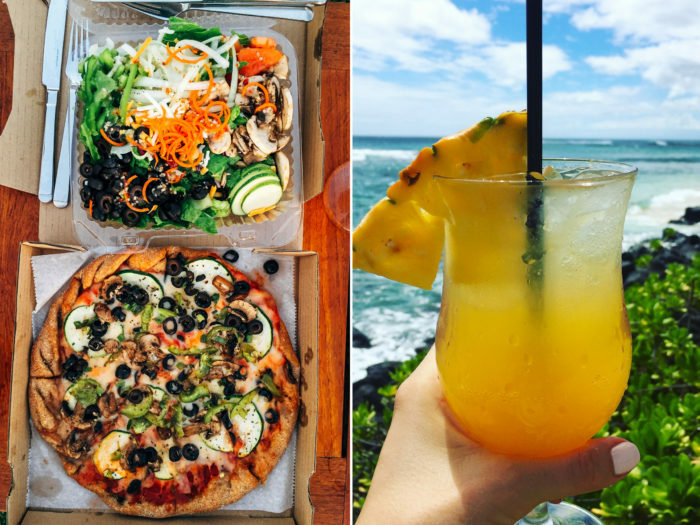 Now I’m dying to go back to Kauai, especially since I didn’t eat at any of those places while I was there besides Red Salt. It seemed like you were there for a pretty short time, I don’t know how you managed to do and see so much! Everyone says the helicopter tour is the best thing you can do but when I was researching which company to go with, I discovered some pretty awful statistics that scared me out of it. Plus the cost was a little high for us. I’m sure it’s worth it though! Wow- what a beautiful trip it must of been. I am totally jealous as I have always wanted to visit Hawaii. Oh and the food…. omg! It is such a special place. I hope you get to go, Starla! I’m dying reading this post! From the views to the food to the hikes, it sounds AMAZING in Kauai! I regret not hopping over there when I was in Hawaii a bunch of years back. Ahhh you’ve made me miss Kauai. I’m actually looking at moving to Hawaii sometime in the near future and work will either take me to Oahu, Maui or Kauai. Koa Kea is THE BEST hotel I’ve ever stayed in. It’s not so much the ‘fanciest’ or nicest, but I love how calm, serene and quiet it is. I miss it!!! WHAT?! You’re moving to Hawaii?? That’s freaking awesome! And yes, that’s exactly why we loved the Koa Kea. It’s intimate but you still have everything you could ever want or need! The only place I’ve been in Hawaii is Maui, and since I’ve been there 4 times I need to visit another island next! 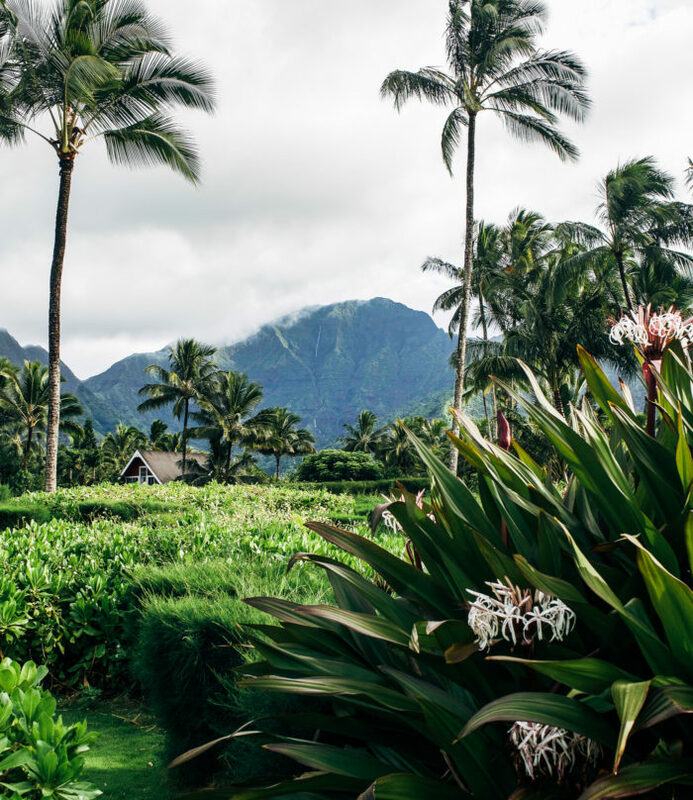 You’ve made me want to hop a plane and go to Kauai tomorrow now with these beautiful photos and great recommendations! Definitely putting this on my list! 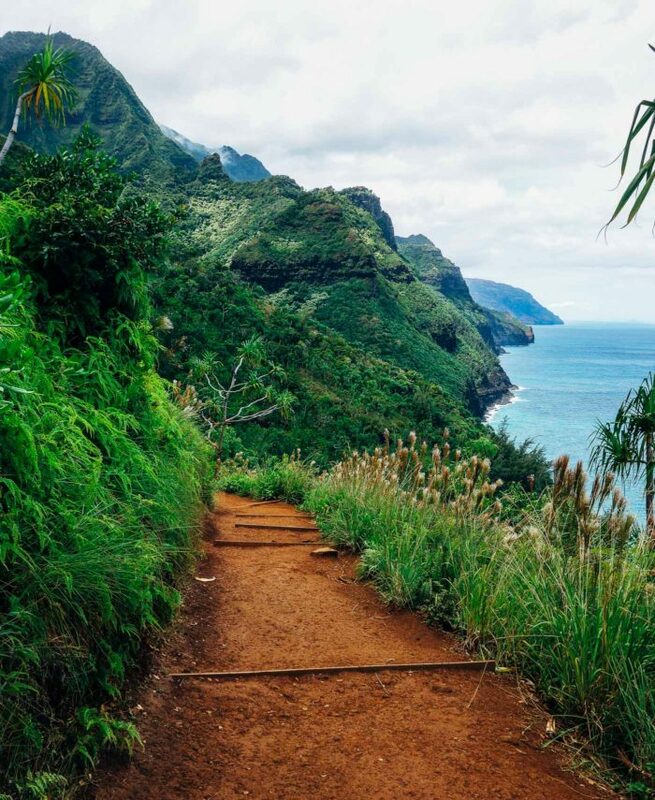 This post me got me really excited for my 2nd trip to Kauai in June!! Thank you for the great suggestions, as in ALL the food spots look incredible!! 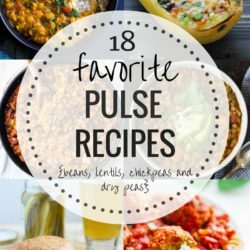 I want to eat at them all. 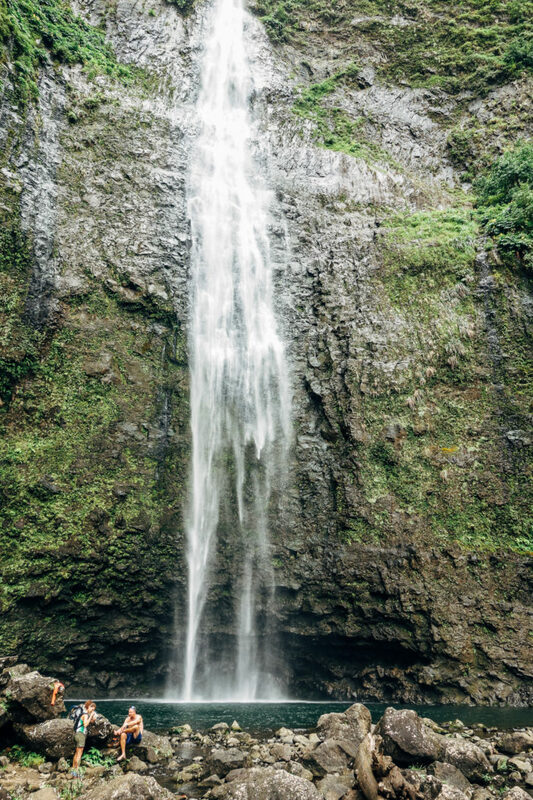 Are the Hanakapi’ai Falls at the beach you hiked down to, or? You have to hike 2 miles to get to the beach and then another 2 miles (that feels like 5 miles) to get to the falls. So that's 4 miles each way. It took us about 5 hours altogether. I'm going to put together a video of that hike too, although I didn't film a lot of it because I was too busy trying not to slip and fall off a cliff, lol! I have a Sony RX100 that I bring with me when I don't feel like lugging the Canon around. It takes beautiful pictures but I feel like it's not that great for video. Some of the clips are from my iPhone 6 and they are just as good. I really want the Canon G7x but I can't bring myself to spend more money on another camera! Hopefully I’ll have a new iPhone by then to take some video… next question: what do you use to string your video clips together? What a wonderful trip you had, thanks again for sharing! I use iMovie on my Mac. It’s pretty easy to figure out! Also, I forgot to mention that I had a GoPro for snorkeling, etc. It might be worth looking into one of those. If it’s not feasible, I would at least look into getting a waterproof case for your iPhone. I linked to the one I have in my Thailand posts. It’s less than $20! Goodness, Sarah! You’ve covered everything! 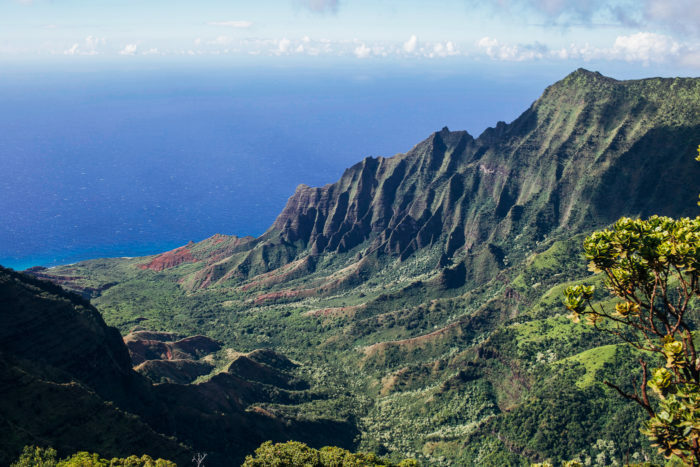 You nailed it, about Kauai; less populated and developed. Although there is a new strip mall with a costco (we were disappointed to see this on our last trip in December). One thing I love about Kauai is not only it’s raw beauty but also the food choices there. You can eat really well while traveling. 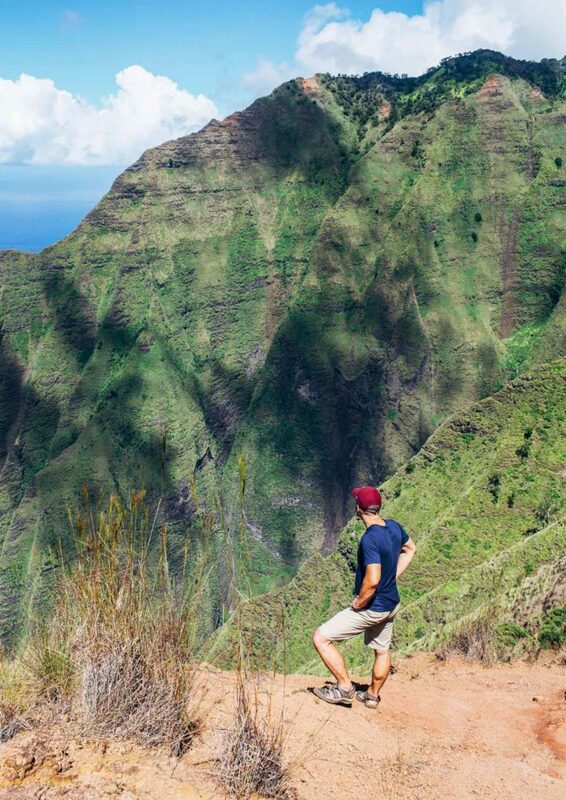 We didn’t make it all the way to the Falls on the Kalalau Trail, but it’s on our to-do list next time we go. 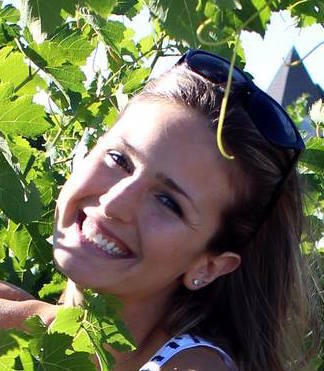 Gorgeous and through review, Sarah! I can’t wait to go back!! The cats… THE CATS. There is a big problem with free roaming and feral cats on all the islands. They have decimated bird populations, particularly ground nesters such as Laysan Albatross, a highly endangered bird. 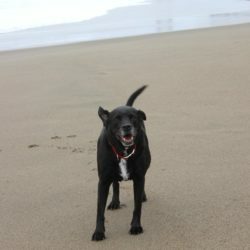 http://www.acap.aq/en/news/latest-news/2043-feral-cats-are-suspected-of-killing-22-laysan-albatross-chicks-on-hawaii-s-kauai-island But there are many other animals they’ve impacted as well. Cats are introduced species, not only there but across the globe. https://www.youtube.com/watch?v=T2adf8_mqBs They are taking a tremendous toll on not just birds but mammals and reptiles. It’s so bad in Australia, they’ve started culling http://www.usatoday.com/story/news/world/2015/10/22/australia-cull-feral-cats/74376614/ It’s a sad situation we humans have created. I agree, it is a shame that we are so careless with our actions and don’t think about the long term effect they have. Hi Carolyn! The trail was pretty busy when we were there so I think it would be okay. I would check the weather too. 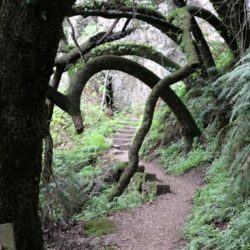 If it’s been raining a lot then you may want to pass as the trail can get extremely slippery. Make sure you wear proper hiking shoes!